Some of my videos have shown some good and bad aspects of the Barclays Cycle Superhighway, some have been critical and got thousands of views and been posted by some big bloggers. Including Dave Hill, David Hembrow, Bikeradar, Road.cc, LCC, CTC and a few more. My videos and blog where noticed by several people at TFL, that’s how I got to test ride the Barclays Cycle Hire bicycle, and I was asked if i would like to ride part of the Barclays Cycle Superhighway route with Nigel Hardy, the project manager for the cycle superhighways. Obviously a great opportunity and one which I was happy to take them up on. We started outside Southwark tube station, where the crossings have countdowns and the whole area seems cycle friendly, speed limits on side roads reduced to 20mph and lots of cycle lanes and parking. A great place to start i think. Our first stop was just down the road, Nigel gave us a general talk about the background and the idea behind the superhighway. He talked about the superhighway being a big task and the first cycle route in major a city in the UK which aimed to take cyclist from the outer reaches to the centre all along main roads. Some sections of the routes would already have cycling facilities, these may not have been up to scratch and they where reviewed. This includes the ASL, and most of them have been increased in size. 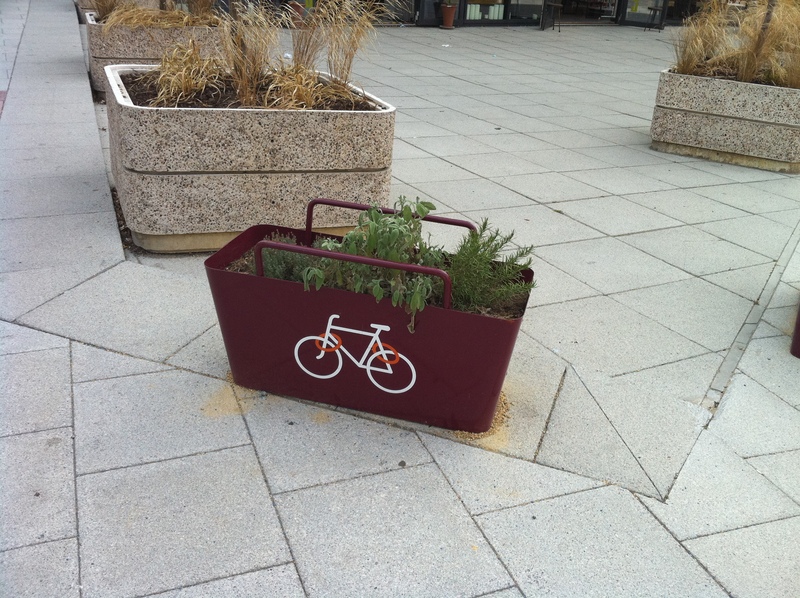 Conveniently placed but easily overlooked where the bike parking flower pots, which showed how you should be locking your bike. From my understanding, these stands where funded by the money that the councils bided for from TFL. Why is the blue paint not constant? Because in some cases it is not feasible to put a cycle lane down, for instance where there is a bus stop, parking spaces or a crossing. In it’s place is a large Cycle Superhighway logo, one at where the cycle lane ends, and one at where it starts again. This is to let vehicle drivers know that they should expect cyclists there and it’s a way to show the cyclists that they are still on the right route. Whilst we all wish that the cycle superhighway could be something like the Dutch have, it wasn’t ever going to be possible straight away. And with around 80% of the route covered by blue cycle lanes, it’s going to be easy to follow and shouldn’t be disrupted too much by parked cars or traffic. 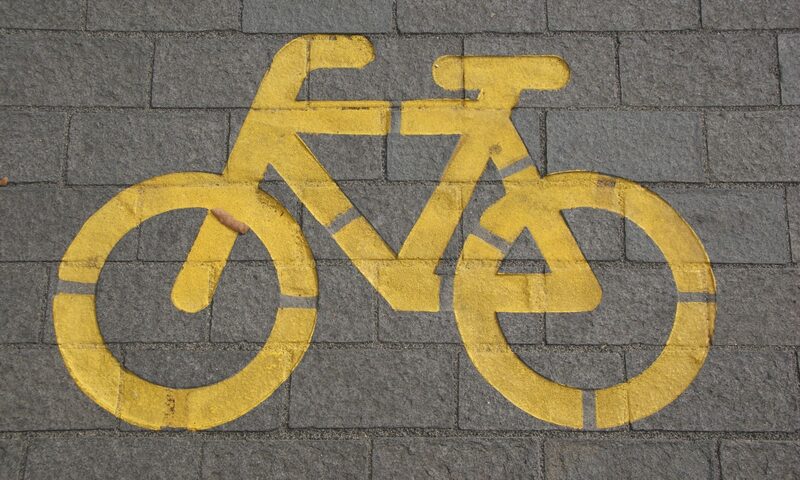 Why all the CS7/CS3 logos on the cycle lane at side roads? This is to make sure that any cars joining from a side road know that the blue lane is a cycle lane and that they should expect to see cyclists along this route. It also serves as a guide for cyclists, they know they are clearly joining a cycle superhighway. Kennington and Oval Northbound, why does the cycle superhighway stop, and then move to the next lane further on? This is because a cycle lane can’t move across the lane of traffic. The danger of giving cyclists a line to follow across traffic is only going to cause conflict. And thus it was thought that stopping the blue cycling lane, and starting it again later on would allow cyclists to move across one lane of traffic easily. This will work at it’s best if the drivers are educated on what the large logo’s mean. Some 2 lane roads turned into one lane. re-vamped segregated and off road cycle paths. A lot more was covered by Nigel Hardy whilst we were out on the cycle super highway and it was a great pleasure to ride the route with him and see how parts of it have developed and exactly what planning went into it. Nigel himself said that these two routes are effectively test routes, where certain ideas and cycling structures are new to London and are being monitored for there effectiveness from both a cyclists and a road users point of view. Did you get a chance to ask about the junction junction at Rookery Road on Clapham Common? They widened northbound section so that they can fit in two lanes and a cycle lane. The left lane is only just wide enough for a car and cyclists are encouraged to be on the extreme left on one of the most left hook inducing junctions on CS7. 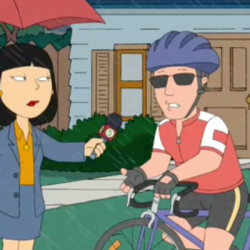 Do you have any footage handy? I took to taking the cycle path as my signal to move into the car lane. Not a good design IMO.